Slice tomatoes and arrange on a plate. Lightly sprinkle with kosher salt. If time allows, macerate shallot in vinegar 20 minutes. Whisk honey, 1 tablespoon of walnut oil and parsley into the vinaigrette. Season to taste with kosher salt, freshly ground pepper and additional walnut oil, if desired. Gently toss diced peaches into mixture. 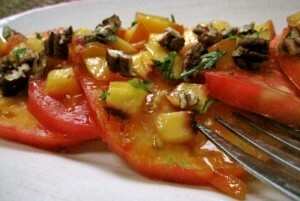 Spoon over tomatoes and garnish with walnut pieces.